Charges have been dropped against a woman who was accused of hitting a 16-year-old girl in the head with a hammer during a melee inside a River North McDonald’s on June 25th. The girl and her parent failed to show up for a court date, leading the judge to drop all charges against 36-year-old Hannah Walker. The girl told police that the dispute with Walker stemmed from a disagreement over who would be served next. At some point, the teen said, Walker pulled the hammer from her purse and started swinging. 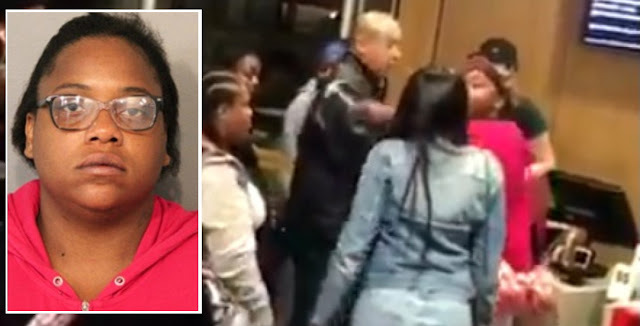 A video that later emerged show several teens arguing with Walker who wielded a hammer after she was backed against a counter. Walker then stood by herself for several minutes while people tried to throw a chair at her and attack her with a mop. The victim was treated at Comer Children's Hospital and released. A Humboldt Park man who escaped from electronic monitoring and spent more than a month on the lam before he robbed a Loop restaurant and wound up back in custody is heading to prison. Alex Harper has been ordered to serve 85% of a six-year term for the robbery, a concurrent sentence of six years for burglary, and an additional concurrent two-year term for escaping electronic monitoring. Back in January, detectives received word that a DNA database had generated a hit on a blood sample taken from the scene of a December 2015 jewelry store burglary in the first block of North Michigan Avenue. The blood found on glass shards in the broken front display allegedly belonged to Harper. Investigators arrested Harper and prosecutors charged him with taking nearly $4,000 worth of bracelets from the store. Judge Stephanie Miller, a champion of the county’s “affordable bail” program released Harper on a recognizance bond and electronic monitoring. Records show that Harper went missing almost immediately and remained on the loose until April 15th. That’s when Harper walked into Spanglish Mexican Kitchen at 555 South State with his hand holding a pointed object inside a paper bag, cops say. He pushed a female restaurant worker, told her “don’t move or I’m going to shoot you,” and took money from the register, according to prosecutors. Police found Harper near the robbery scene with the restaurant’s money in his pockets. Harper has an extensive felony record, which includes three years in prison for retail theft in 1994; eight years for aggravated battery in 1994; fifteen years for robbery in 1994; seven years for burgalry in 1990; six years for aggravated arson in 1985; six years for burglary in 1985; two years for unlawful restraint in 1981; and four years for robbery in 1981. He is scheduled to be paroled on February 28, 2024. 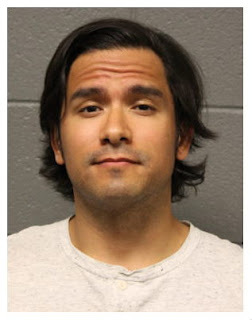 • A Chicago Lawn man who was accused of forcing his way into a Loop TV station while claiming to be in love with one of the outlet’s female news anchors has been sentenced to six months probation. Vincent Liceaga, 34, was arrested late on May 10th at the ABC7 studios after he allegedly pushed his way into the station at 190 North State as a security guard opened an employee access door. Prosecutors said Liceaga tried to “engage and make contact with” the reporter and police said Liceaga “claimed he and the victim were in love and emailing one another.” The victim denied ever seeing or having contact with Liceaga. A station security guard told police that he saw Liceaga loitering outside the station and other employees reported seeing him behaving strangely on numerous occasions, police said at the time. 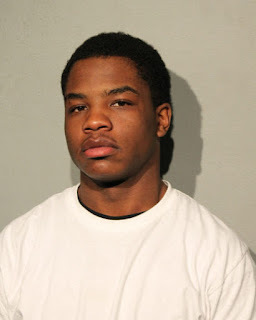 • A Chicago man who was charged with robbery after his victim crossed paths with him two hours later in a Gold Coast currency exchange on December 29th has been sentenced to two years in prison. Vladimir Artis, 20, pleaded guilty to robbing the 30-year-old victim at gunpoint in the first block of East Elm Street at 7:55 a.m.
Artis was arrested about an hour after the robbery when the victim found himself standing near Artis at a currency exchange in the 100 block of West Division. Cops were called again, and Artis was arrested after he led police on a short foot chase through the Clark/Division Red Line station and a nearby condominium building lobby, authorities said. Artis was carrying a handgun with a defaced serial number when cops caught him, police said in their report. Prosecutors dropped unlawful use of a weapon and ten other felony counts as part of the plea deal that was approved by Judge William O’Brien. Artis is scheduled to be paroled on December 22nd, 2019. A Washington Park man who has been repeatedly charged with stealing from cab drivers in the Loop and Mag Mile neighborhoods has pleaded guilty to his most recent case. Darreece Euring was sentenced to pay $100 restitution, a $359 fine, and to serve 131 days in jail in exchange for pleading guilty to “burglary without damage” in connection with the theft from a cabbie near State and Adams. Just before noon on May 18th, cops on patrol saw a taxi driver chasing Euring in the 300 block of South Michigan. The officers caught Euring and the cabbie explained that Euring had just stolen $59 from the driver’s side door of his taxi in the first block of West Adams, police said. Cops allegedly found the cash in the 21-year-old’s pants pocket. When officers ran Euring’s name through a database, they reportedly discovered a warrant out for his arrest in connection with another theft from a cabbie on May 8th. That time, Euring stole a cab driver’s phone at State and Madison, according to prosecutors. According to court records, Euring was previously accused of stealing from downtown taxi drivers on November 5, 2017; November 30, 2017; December 16, 2017; March 12, 2018; and April 1, 2018. • A 52-year-old woman who’s worst crime appears to be picking the wrong victim’s purse to steal, has been sentenced to 4-1/2 years in prison. 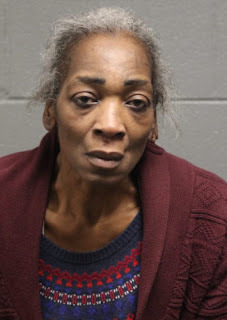 Prosecutors said Michelle Cook stole a purse from under the chair of a woman who was dining at Petterino’s restaurant in the Loop. What Cook did not know is that the woman who owned the purse was a federal judge. Cook had not been arrested in Chicago since 1995 when she entered the restaurant on January 13th, took Judge Joan Lefkow’s purse, and subsequently used the jurist’s credit cards to make $1,159 in purchases at a nearby Target store. Police arrested Cook at the store and reportedly found a Michigan ID in her purse that belonged to a woman named “Emily Chen.” A picture of Cook's face had been glued over Chen’s, according to police. In exchange for her guilty plea, prosecutors dropped twelve additional felony counts, including aggravated identity theft of a victim over age sixty. She is scheduled to be paroled on April 16, 2020. Judge James Obbish approved the plea deal. According to the Illinois Department of Corrections records, Cook’s last prison term was a three-year sentence for forgery in 1991. She previously served a trio of concurrent two-year terms for forgery in 1989. Finally, a student at The Ohio State University has received a year of court supervision in exchange for an incident involving two traffic aides during Lollapalooza this summer. Prosecutors allowed nineteen-year-old Jordan Richardson to plead guilty to a single charge of disorderly conduct in the plea deal. Prosecutors said Richardson was crossing against the light at Michigan and Van Buren around 5:30 p.m. on August 2nd when a female traffic aide told him to clear the street. When Richardson flipped the woman off and said “f*ck you,” the traffic aide said “f*ck you” in return, an assistant state’s attorney said. Richardson then pushed the woman in the chest and slapped her radio equipment to the ground, according to initial charges. A male traffic aide intervened, and Richardson head-butted the man in the nose, punched him in the face, and fled the scene, prosecutors said in August. Police arrested Richardson nearby in the 400 block of South Wabash. Felony charges of aggravated battery to a government employee and criminal damage to government property were dropped in the deal, which was approved by Judge Marvin Luckman.